The demand of miniaturization of power systems has accelerated the research on high-switching-frequency power converters. 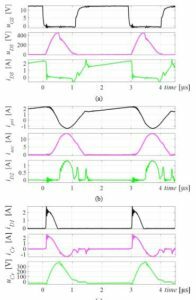 A flyback converter in resonant mode that features low switching losses, less transformer losses, and low switching noise at high switching frequency is investigated in this paper as alternative to a conventional quasi-resonant flyback topology to increase power density. In order to find a compromise between magnet size, electromagnetic interference (EMI), and efficiency, the concept utilizes the resonant behavior between transformer leakage inductance and snubber capacitor to achieve near-zero-voltage switching at both turn-on and turn-off of the primary switch, low core loss due to a continuous transformer magnetizing current, and reduced EMI due to low di/dt and dv/dt values. Meanwhile, the concept uses the regenerative snubber to recycle the transformer leakage energy with two snubber diodes and one snubber capacitor. The proposed concept has been validated on a 340kHz 65W prototype. Compared to the conventional quasi-resonant flyback converter operating at the same switching frequency, the proposed concept has 2% efficiency improvement and better EMI performance. Fig. 1 Proposed flyback converter, (a) schematic of the proposed concept, (b) equivalent circuit of the proposed concept. Fig. 2. Measured waveforms of resonant-mode operation, D = 0.6. (a) Switch Si voltage and current; (b) Current of each transformer winding (c) Snubber diode current, resonant capacitor voltage and current. Fig.3. Measured waveforms of resonant flyback at high input voltage, Ui=360V, fs=250kHz, Po=38W. 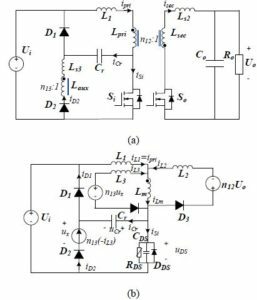 In this paper, a flyback converter in resonant mode is proposed to enable soft switching, less transformer loss and reduced EMI at high switching frequency. Experimental results show that, compared to the conventional flyback converter operating in QR/DCM and while achieving the same specifications, both the fundamental quasi-peak and the high-frequency harmonics in the measured common-mode EMI are reduced due to the resonant behavior, and the switching loss on the primary switch is minimized due to the achieved soft switching in both turn-on and turn-off of the primary switch. Furthermore, the transformer core volume is reduced by one third compared to the low-frequency conventional flyback converter. In conclusion, the resonant-mode operation of the developed flyback converter enables higher power density, high efficiency and better EMI performance at high switching frequency. Therefore, the improved flyback topology is suitable for low-power isolated DC/DC converters with limited input voltage range. Watson; F.C. Lee; G.C. Hua, “Utilization of an active-clamp circuit to achieve soft switching in flyback converters,” IEEE Transactions on Power Electronics, pp. 162 – 169, Jan 1996. Xi; P.K. Jain; G. Joos; Y. Liu, “An improved zero voltage switching flyback converter topology,” in 29th Annual IEEE Power Electronics Specialists Conference, Fukuoka, May 1998. Ching-Lung Chu; Ming-Juh Jong, “A zero-voltage-switching PWM flyback converter with an auxiliary resonant circuit,” in International Conference on Power Electronics and Drive Systems, Taipei, Nov. 2009. Wei, X. Huang, J. Zhang and Z. Qian, “A Novel soft switching flyback converter with synchronous rectification,” in IEEE 6th International Power Electronics and Motion Control Conference, Wuhan, May 2009. “NCP4304: Secondary Side Controller,” ON Semiconductor, 2015. [Online]. Available: http://www.onsemi.com/.